Log Cabin Mailbox - - the handcrafted real wood roadside mailbox for log cabin owners and everyone dreams of owning a cabin in the country. Simulated log construction with drop-down "log" door. Red mailbox flag attached to the chimney. Designed to attach to a post-mounted board. UV protection to resist fading. 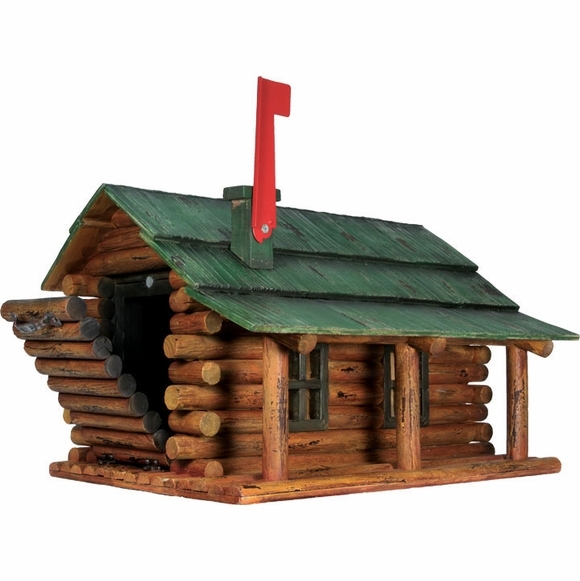 Dimensions: 22.5"L x 16"W x 15"H.
Log cabin curbside mailbox looks like a miniature log cabin with green roof.